The All-New Original Movie Is Available for The First Time on DVD, Blu-ray Combo Pack, & Digital HD! BURBANK, CA (March 6, 2014) Warner Bros. Home Entertainment Group is tickled pink to announce the release of Sophia Grace & Rosie’s Royal Adventure on DVD, Blu-ray Combo Pack and Digital HD on May 20, 2014. The super-cute, talented two-some of Sophia Grace and Rosie sang and danced their way to stardom on The Ellen DeGeneres Show. Now you can see the little, lovable performers in their first original live-action movie! Following the success of their first book, “Tea Time with Sophia Grace & Rosie,” these pint-sized stars are sure to knock your socks off in their first movie, which includes marvelous bonus features. 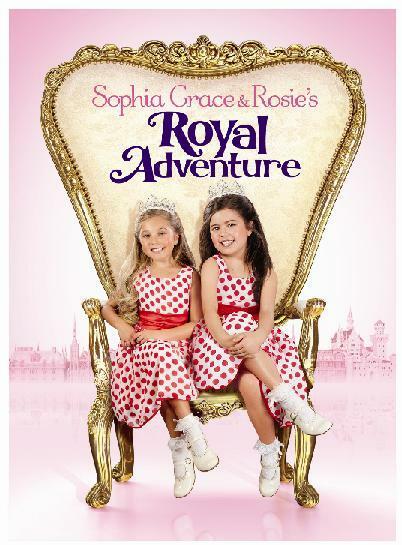 The Sophia Grace & Rosie’s Royal Adventure original movie will carry a suggested retail price of $19.98 for the DVD and $24.98 for the Blu-ray combo pack, with a retailer pre-order date of April 15, 2014. The Original Motion Picture Soundtrack is available to pre-order and will also be released on May 20. The release of Sophia Grace & Rosie’s Royal Adventure will be supported by a robust national publicity campaign; estimated to generate millions of impressions. Posted in News, Press Releases, Warner Bros.Tagged Sophia Grace & Rosie, Sophia Grace & Rosie’s Royal Adventure, The Ellen DeGeneres Show, Warner Bros.